UV image of a 100,000 kilometer exploding solar filament (August 31, 2012). Credit: NASA/SDO/GSFC. The intensity of the Sun’s magnetic field and solar wind periodically decline to low levels but explosive events are possible. ACE is in orbit around the L1 LaGrange point approximately 1,500,000 kilometers from Earth and will remain there until 2024. Scientists hope that data from the spacecraft’s onboard sensors will help them understand how the Solar System formed, including how the solar magnetic field moderates incoming high-speed ions. Several research groups have been investigating a possible link between our climate and cosmic rays. When the Sun is in a relatively quiescent state with few sunspots visible, it occasionally erupts with solar flares that can reach incredible velocities. As a matter of observation, they continue to accelerate as they move away from the Sun. What explains this counterintuitive process? Rather than shock fronts or so-called “magnetic reconnection events”, the solar wind receives its impetus from an electric field that emanates from the Sun in all directions. The easiest way for charged particles to accelerate is within such a field. The Sun’s e-field extends for billions of kilometers, ending at the heliospheric boundary, which the twinVoyager spacecraft are just now beginning to penetrate. The “mysterious” acceleration of positively charged solar wind particles is an electrical phenomenon that is predicted by the Electric Sun model. 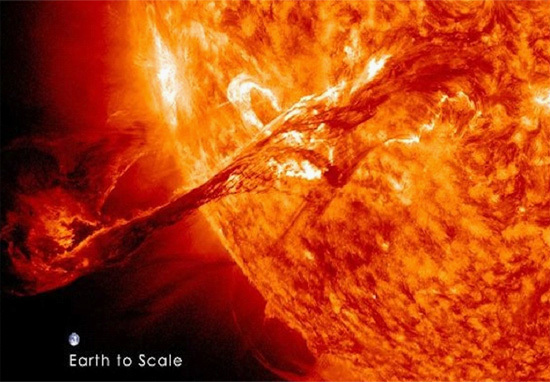 Solar flares are labeled C, M, or X: light, medium, or powerful. On September 7, 2005 an X17 CME impacted Earth’s magnetosphere, knocking out radio transmissions and overloading power station transformers. A veritable cosmic blast of positive ions poured into the electrically charged environment of our planet. In 1997, Henrik Svensmark and Eigil Fris-Christensen published “Variation of Cosmic Ray Flux and Global Cloud Coverage – a Missing Link in Solar–Climate Relationships” in which they argue for the Sun’s mediating influence on Earth’s climate. Essentially, the greater the number of high-energy ions that enter our magnetic field, the greater will be the cloud cover. Mike Lockwood and Claus Fröhlich issued a paper in 2007 that contradicted any idea of a heliocentric influence on cloud cover. Although they acknowledge that it might have had a small effect in the past, they assert that humanity’s industrial activity is so great that it overshadows a solar connection. Of course, they completely ignore the role of electricity in space and contend for purely mechanistic and chemical interactions.